On our trip to the beach we spent a rainy morning making clay beads with the cousins. All the cousins ages 3-11 had a great time making the beads! We used polymer clay of all different colors (there was a sale on polymer clay at the craft store before we left) to make a milliflore style bead. All the kids helped by rolling out long clay worms of all different colors, we then put the worms together and wrapped them in a thin layer of a different color. I then took the large multicolor worm and rolled it more until it was long and then. After rolling them out a little more we sliced the multi-color worm into little pieces. I did this part with a sharp kitchen knife but if you have an exacto that works best. We then put all the little slices on a paper plate. 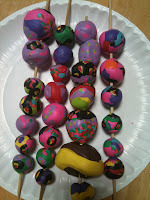 Next all the kids made their own beads of solid color clay by rolling the clay in their hands to create a ball. They then choose slices and placed them on their bead. Once they had covered their bead with slices they rolled it in their hands again to smooth out the surface. We put all the finished beads on wood skewers to create a hole. After all the beads were finished we baked them in the oven at 250 degrees for 15 minutes. We left the beads right on the skewers just making sure the beads were not touching. After they had cooled we strung them on elastic adding a large button at the end for the clasp. The Bee loved making the beads and loved even more wearing a necklace she had made! Step 5) put the beads on the skewer and bake in oven on a baking sheet at 250 degree for 15 min. Step 6) After the beads have cooled sting them onto a piece of elastic or sting. We used an over sized button for the clap.